More and more of us are discovering the rewards of growing our own food - and there's plenty of advice to be found on how to do so. But what about producing larger quantities to sell? And even trying to make a living from this amazing and essential thing? finding landwinning customers and marketing your produceworking out what equipment you'll need (and how much to budget for)sourcing fundingmanaging your accounts - and doing the tax and legal paperworkdeciding which crops to grow. With an extensive directory of invaluable contacts and resources, Gardening for Profit is packed with solid, first-hand advice. It provides all the reassurance you might need that earning an income from horticulture is perfectly possible. 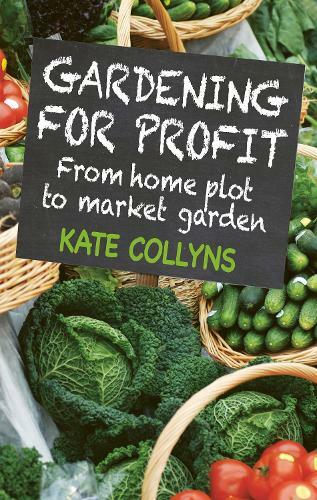 "Kate Collyns has made a gutsy switch from urban living to running her own market garden, without owning any land. She is the person to guide you through a challenging and rewarding process. It is not all roses for sure, yet there is a lot of sweetness in this book!" Charles Dowding, author & grower "A short guide to sustainable market gardening is a timely publication, with more and more people setting up community gardens. Turning a hobby into a business is never easy, and books on how to manage the business of growing crops are rare." Alan Schofield, Chairman Organic Growers' Alliance "People increasingly want to know where their food comes from, and there is a large movement of young people setting up market gardens to supply local markets. Getting it right is not easy, but Kate has been there and done it: a graduate of the Soil Associations Apprenticeship Scheme, she has worked with a box scheme and then set up her own market garden, supplying local farms shops and restaurants. A must-have for anyone setting up for the first time."